An NDP MPP asked the premier to "unequivocally denounce Faith Goldy." 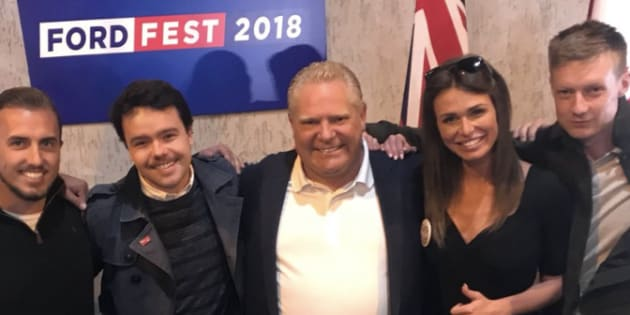 Premier Doug Ford poses for a photo with white nationalist Faith Goldy at Ford Fest on Saturday. Premier Doug Ford refused to denounce a far-right commentator on Monday who turned up at Ford Fest over the weekend. NDP MPP Jill Andrew asked Ford to "unequivocally denounce Faith Goldy" and apologize for posing for a photo with her, calling Goldy a "white supremacist, neo-Nazi sympathizer." Ford denounced the NDP and Liberal MPPs instead. "Boy, Mr. Speaker, they've sunk to a new low," Ford said of the Opposition. "I can't help when thousands of people are coming at you and they're taking pictures right, left and centre." The only thing anyone at Ford Fest talked about was Ontario's deficit, the premier said. "They're disgusted by this financial scandal they face right now in the province of Ontario." Watch: Federal NDP leader calls Doug Ford a 'fringe' candidate. Story continues after video. Ford Fest is an annual barbeque held by the premier's family in the GTA. Supporters of "Ford Nation," what the premier and his late brother called their political movement, enjoy free food and drinks. Goldy is a white nationalist who's appeared on a neo-Nazi podcast, said that civilizations should be divided along racial lines and believes white North Americans are currently experiencing genocide. She's running for Toronto mayor, though she's been excluded from major events and debates. Mayor John Tory debates "anyone who does not have a history of spreading hate speech or bigotry," spokeswoman Keerthana Kamalavasan told HuffPost Canada in an email. Now, Goldy's using a photo of herself with one arm around Premier Ford for her campaign. "Faith Nation IS Ford Nation," she wrote on Twitter. HuffPost Canada asked the premier's office why Goldy was allowed next to Ford, if he condones her message, if he endorses her candidacy for mayor, how he feels about his photo being used for her campaign, and what his message is to white supremacists who feel emboldened by the photo. "The Premier denounces all forms of hate, regardless of who says it," Ford's spokesman Simon Jefferies answered in an email. "Ford Fest was a diverse event with over 7,000 people in attendance from nearly every race, religion, and community across the province. Premier Ford was made available to take pictures with everyone in attendance." The Progressive Conservative party, which paid for Ford Fest, did not respond to HuffPost Canada's questions in time for publication. Andrew said Ford's refusal to denounce Goldy gives her the legitimacy she craves. "Groups like the Canadian Anti-Hate Network registered deep concern about Goldy at the outset of the Toronto campaign, saying that they 'expect her to try to use her mayoral run as a platform to spread hate.' They asked media and other candidates not to legitimize her campaign, and she's clearly used this photo with Ford to claim exactly that sort of legitimacy," she said in an NDP press release. "Sadly, we live in a time where hate groups pushing bigotry and seeking to divide people are on the rise," she said. The PC government faced other questions about racism on Monday. "Does the Anti-Racism Directorate still exist, and if so, can you tell this House exactly what is the next step you will be taking in order for it to reach its mandate?" asked Liberal MPP Michael Coteau. The directorate advised the government on how to eliminate systemic racism. Experts who served on the directorate's subcommittees have said Ontario's new government told them their services are no longer required. Ford said he denounces "all forms of hate" and again deflected to the province's deficit, which his government says the Liberals downplayed by $8 billion. "What was he doing when his team was wasting $15 billion of the taxpayers' money? ... How many backroom deals was he involved in?" the premier said of Coteau. The answer was "insulting," Coteau told HuffPost Canada. "Imagine, I'm asking a question about systemic racism and the premier accuses me of being a crook. It's pretty ironic." The MPP also said photos like the one of Goldy with Ford are sometimes taken when politicians go to public events with thousands of people. "I don't think Doug Ford is a racist ... but I do think as premier he has an obligation to stand up and denounce that stuff when provided the opportunity." CORRECTION: A previous version of this story said that NDP MPP Jill Andrew referred to Premier Doug Ford as a neo-Nazi sympathizer. She was talking about Faith Goldy, not Ford.